The parking area that I have designated as the trailhead is basically a small pull-off located on the last switchback before actually driving into Armer Gulch. This is an amazingly short hike. The total in and out distance is only 1.50 miles. It's hard to believe that such a special place could be so accessible yet visited by so few people. 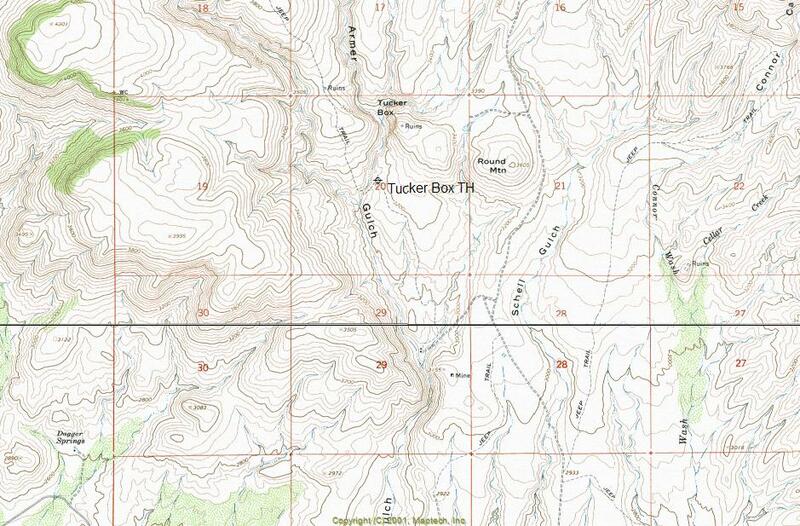 I think the reason so few people hike to Tucker Box is that canyon leading up to it is somewhat intimidating. 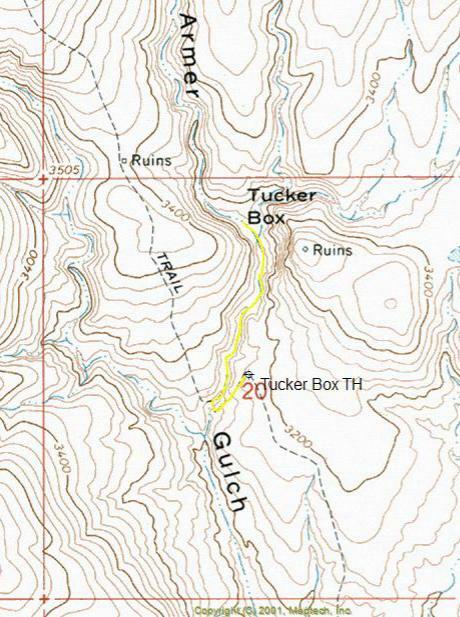 There is no existing trail to Tucker Box. The hike immediately starts up a rocky, deep and narrow canyon with tall cliffs on both sides. (WARNING) NEVER ATEMPT THIS HIKE AFTER MIDDAY DURRING MONSOON SEASON!!! This is not a place you want to be standing during a flash flood. The water depth in the narrow portion of the canyon can reach ten feet at flood stage. Armer Gulch is one of the main drainages coming out of the high hills above Roosevelt Lake and is known for having flash floods. Although a short hike, the canyon is fairly rugged. Before reaching the riparian area you will be spending your time constantly boulder hoping. At the midpoint you will encounter a narrow slick rock waterfall that is somewhat precarious to climb around. Once you reach the lower portion of Tucker Box, the canyon turns into a jungle bushwhack. If your idea of a good time is something other than being scratched from head to foot with a constant full body itch, this is defiantly not the hike for you. Amazing is the only way to describe Tucker Box. The hills surrounding the riparian area are beautifully rugged with red rock jagged cliffs. There are frogs everywhere along the creek area. It is so thick and lush that you can barely make your way through it. Tucker Box has gotten particularly lush over the last couple of years due to higher than normal moisture percentages for the area. As a little side bonus to this hike is a well-preserved Indian ruin on the summit of the mountain just southeast of the riparian area. Reaching the ruins from Tucker Box is very difficult. The best way to get to the ruins is to hike up the slope from the parking area. This is a special little place that should defiantly be on your must see list if you have the same love for the area that I have. Count on having it all to yourself if you go. From Mesa take Highway US60 towards Globe. Before Globe turn left on Highway 188 towards Roosevelt Lake. Before Roosevelt Lake turn on highway 288 to Young. Just before Highway 288 heads away from the hills above the lake you will be turning on FR60 (A-Cross Road). The A-Cross Road (FR60) is a dirt road that is not suitable for wet weather travel. Once on FR60, drive approximately 5.00 miles to FR97 and turn right. Drive on FR97 approximately 5.00 miles to the Tucker Box Trailhead. At roughly 3.75 miles on FR97 you will drive past the Jack Shoe Ranch on your left, which is located along Armer Gulch. 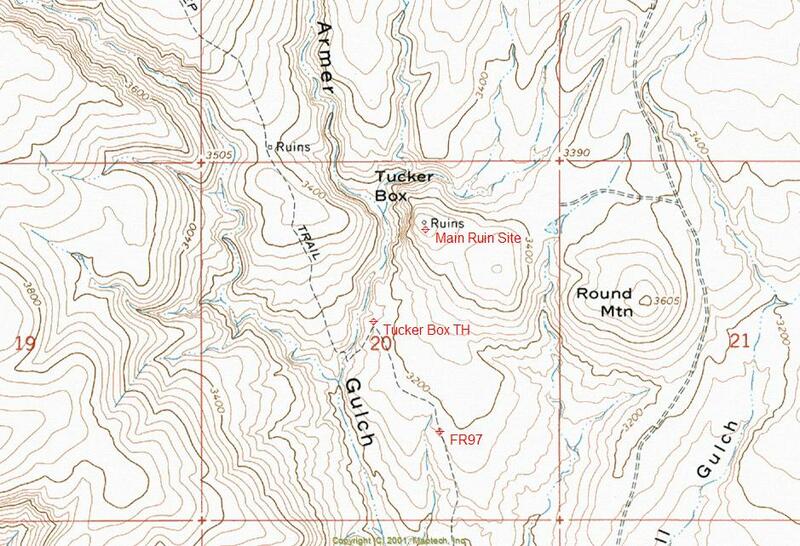 The entire drive to Tucker Box can be done in a high clearance two-wheel drive truck during dry conditions. The road beyond the trailhead requires four wheel drive.